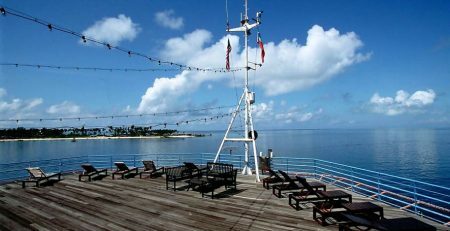 At Seaventures we’re really lucky to dive at two of the best dive locations in the world – Sipadan, of course, but also, Mabul. Mabul has long been regarded as a mecca for macro diving and our dive team simply love showing our guests where to find and photograph some of the most interesting macro life in the world. In the last few weeks alone, we’ve seen Ghost Pipefish, Candy Crabs, Bobtail Squids, Flamboyant and Pygmy Cuttlefish, Pygmy Seahorses, countless Nudibranch, Shrimps and Crabs, Squat Lobster and Frogfish. Today we’re going to tell you a little bit about one of our favourites – the Ornate Ghost Pipefish. The Ornate Ghost Pipefish is found almost exclusively in the warm, tropical waters of the Indo-Pacific region. They tend to live on reef edges and grow to an approximate size of 10-15cm. If you look closely, you will see that the white parts of their body are almost transparent and the rest of their body tends to adopt the colours of whatever host crinoid or soft coral they live on – normally, hanging upside down. One of the reasons they hang upside down is so that they can eat small shrimps and crustaceans that find their way into the host. When Ornate Ghost Pipefish give birth they push their larvae – almost 350 eggs – out into oceanic currents. Once born, the young Ornate Ghost Pipefish will search for a host (which they will stay with for their relatively short life) and then begin to adopt the colours of that host – one of the reasons they are so hard to find. 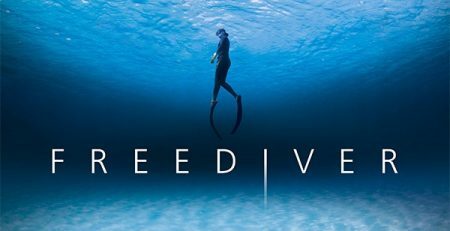 Once they reach full maturity they will mate and reproduce, with the female caring for the eggs in a specially adapted pouch on her ventral fins. Ornate Ghost Pipefish come in a variety of striking colours and rarely stray far from their host. As such, they are a firm favourite of photographers. 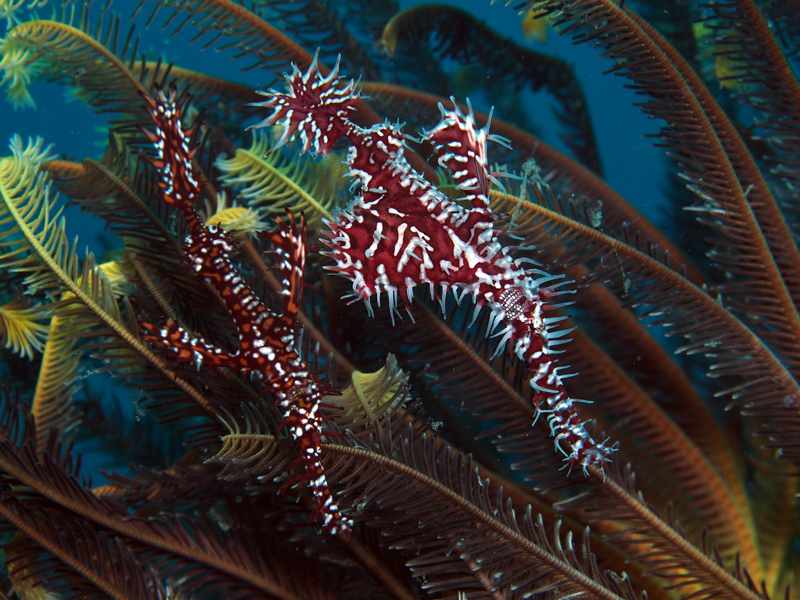 Ornate Ghost Pipefish are sensitive. By all means take photos – and their texture and colours make for stunning photos – but try and minimise the use and intensity of flashes, the number of photographers taking pictures, the number of photos you take and your distance from the subject. And of course, try and be mindful of the environment around you. 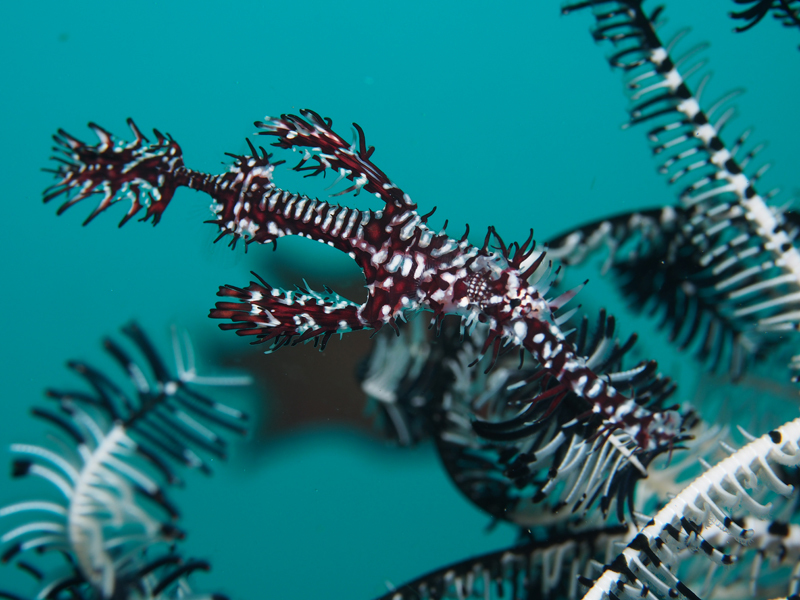 At the moment we have about three sites where we routinely see Ornate Ghost Pipefish. So, when you’re next on the rig, let us know if you’re interested in seeing these beautiful animals, we would love to share them with you.